It's Sunday, which means it's time for In My Mailbox, a weekly meme typically hosted by Kristi at The Story Siren (note: no more roundups in 2010 - she'll be hosting them again in 2011!). 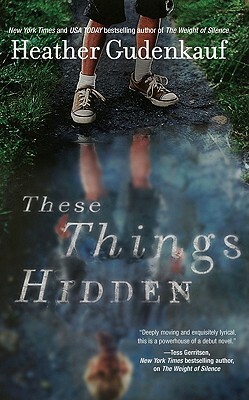 These Things Hidden by Heather Gudenkauf (Mira Books [Harlequin], February 2011). When teenager Allison Glenn is sent to prison for a heinous crime, she leaves behind forever her reputation as Linden Falls' golden girl. Her parents deny the existence of their once-perfect child. Her former friends exult in her downfall. Her sister, Brynn, faces the whispered rumors every day in the hallways of their small Iowa high school. It's Brynn - shy, quiet Brynn - who carries the burden of what really happened that night. All she wants is to forget Allison and the past that haunts her. But then Allison is released to a halfway house and is more determined than ever to speak with her estranged sister. Oooh, it sounds kind of intense! What did you get in your mailbox this week? And what books are you hoping Santa's going to bring you? ?